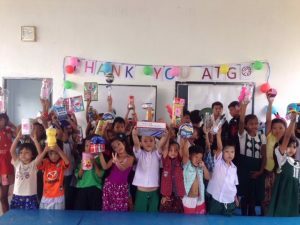 Thanks to the help of our Ambassador, Nong Thangsaksathit, ATG was able to finish our final disbursement for the year to Thaplamu Safe Haven and Learning Center in the Phang-Nga province in southern Thailand. We were able to provide aid to 71 children from the ages of 3-10 years old. Aid was given in the form of clothes, nutritious food for school staff to prepare school lunch, milk, drinking water, supplementary food for small children, first aid kits and learning materials (stationary, textbooks, etc). 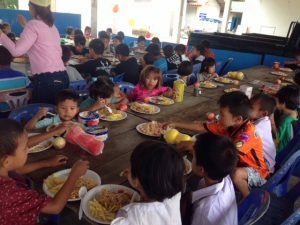 The pre-school in Thaplamu provide day-care and early education opportunity for undocumented Myanmar migrant children in Thaplamu district in Phang-Nga province. It is estimated that at least 10% (4 to 5 million people) of the Thai workforce are migrants, the majority coming from Myanmar. Myanmar migrants often bring their families with them and sadly, many children have been left behind when their parents get arrested and deported. Thai policy allows migrant children equal access to compulsory education; however, in most instances, migrant children are discriminated against in the Thai education system (mainly due to language barrier) and many parents cannot afford to enroll their children due to their economic difficulties. Most parents are working in fishing and construction sectors. The school depends on workers’ charity and partially parents’ contribution which are insufficient and not sustainable to even cover basic service. Children don’t have enough books and stationary for study. The school doesn’t have a proper classroom and in some months the school cannot afford to provide milk or lunch to children (in which normally children spare some lunch from school for their own dinner at home). This pre-school does not only provide education but also protection to the children as they will be very vulnerable at home when their parents are at work.